…his work went to crap. …he drank a bottle of hot sauce and his new chair set the building on fire. I don;t really have a funny comment, but having arrived at work 1t 7:15 this morning, this pic hits a little too close to home. Well not really! I am, after all, surfing the web right now. We haven’t forgotten about the contest…but am waiting (possibly pointlessly) for a few more responses. Don’t get me wrong…these are all GREAT responses…but I’d like to encourage a little more interaction. Hell…you guys could even put a fake name in for an entry. True interactivity would be awesome…but we’ll settle for smoke and mirrors. Bill: Accounts Payable, Bill speaking…arrrrrrrggghhhh..ooooh….how may I help you. Mr. Coleman: Bill? Coleman here. You’re doing it aren’t you? Mr. Coleman: You’re…you know…sitting on that thing aren’t you? Bill: Well it is the only thing I have to sit on sir. Mr. Coleman: No what I mean is…well, you’re using it aren’t you? Right now as you’re talking to me, you’re…Bill it’s just more than I can tolerate. Bill: How do you mean sir? Mr. Coleman: I can’t tolerate speaking to you, trying to have a normal conversation…knowing what it is that you’re doing. Or what you might be doing while you’re speaking to me. I can’t think clearly knowing that you might be…you know…doing your…taking a…well let’s just say it, dropping a deuce while I’m trying to carry on a professional conversation. That kind of thing belongs in your personal time Bill, not the firm’s time. It’s distracting. And not in the way that Angela’s red blouse is distracting, it’s distracting in a way that bothers me. Bill: Well sir, would it help you to know that with the time I am saving by multi-tasking during my “personal time” I have been able to complete an additonal spreadsheet per day. Mr. Coleman: No Bill it doesn’t help. Because now everytime I look at one of your spreadsheets I’ll be wondering what you were doing when you completed it. I won’t be thinking Bill’s Spreadsheet…no, I’ll be thinking Bill’s Spreadcheeks. Bill: Well sir, I want to be known for my work product and part of that is my efficiency. This is just more efficient. 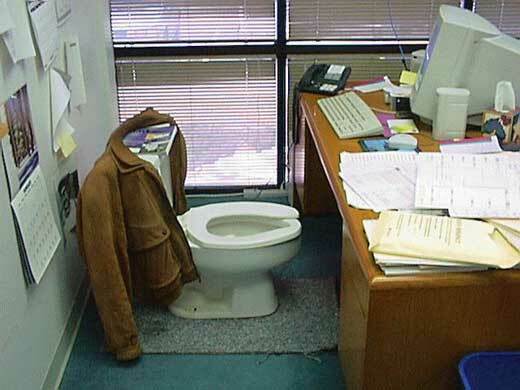 Maybe if you set up everyone’s cubicle like mine it would be less distracting for you? Mr. Coleman: You’re a strange sumbitch Bill. Very strange. Bill: Sir? I need to put the phone down for a minute. Can I call you back?